The upper bin supports up to 500 sheets of paper in A3, A4, A5, Folio, Executive, JIS-B4, JIS-B5, Letter, Legal, Ledger or Tabloid and Statement sizes. Paper (16 to 58 lb., 60 to 220 gsm) and glossy paper may be used in this bin. Hole punching is supported for paper in this bin. Bin 1, the middle bin, supports up to 1500 sheets of paper in A3, A4, Executive, Folio, JIS-B4, JIS-B5, Letter, Legal and Ledger or Tabloid sizes. Paper (16 to 58 lb., 60 to 220 gsm) may be used in this bin. Stapling of sets of 50 sheets of paper is supported. Hole punching of paper (16 to 47 lb., 60 to 176 gsm) and offset stacking is supported. Bin 1 has a empty and a full sensor. Bin 2, the lower bin, supports paper in A3, A4, Executive, Folio, JIS-B4, JIS-B5, Letter, Legal and Ledger or Tabloid sizes (16 to 24 lb., 60 to 90 gsm). 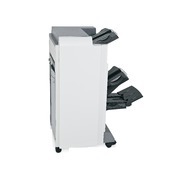 The lower bin, supports saddle stapling of up to 18 sets with up to 15 sheets of folded 20 lb. (75 gsm) paper. Bin 2 has a full sensor. The upper bin supports up to 500 sheets of paper in A3, A4, A5, Folio, Executive, JIS-B4, JIS-B5, Letter, Legal, Ledger or Tabloid and Statement sizes. Paper (16 to 58 lb., 60 to 220 gsm) and glossy paper may be used in this bin. Bin 1, the middle bin, supports up to 1500 sheets of paper in A3, A4, Executive, Folio, JIS-B4, JIS-B5, Letter, Legal and Ledger or Tabloid sizes. Paper (16 to 58 lb., 60 to 220 gsm) may be used in this bin. Stapling of sets of 50 sheets of paper is supported. Hole punching of paper (16 to 47 lb., 60 to 176 gsm) and offset stacking is supported. Bin 1 has a empty and a full sensor. Bin 2, the lower bin, supports paper in A3, A4, Executive, Folio, JIS-B4, JIS-B5, Letter, Legal and Ledger or Tabloid sizes (16 to 24 lb., 60 to 90 gsm). The lower bin, supports saddle stapling of up to 18 sets with up to 15 sheets of folded 20 lb. (75 gsm) paper. Bin 2 has a full sensor.